The 22 Space-soundMilieux of the piece have been created from natural, audio-microscopied sounds and noises, which are extracted from the underlying three basic categories of resources for material ”nature – animal – human”. Please, select from six sound examples of different space-sound milieux on the music-page (mp3-format). 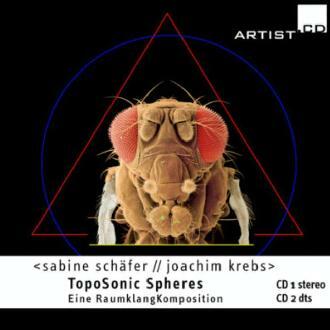 "TopoSonic Spheres – A Space-soundComposition"
In collaboration with SWR (German Südwestrundfunk), a bundle has been released containing both the stereophonic and the 4-channel version. By means of the publication in DTS / 5.1 surround format, even multiple-channel versions of the artist duos´ Space-soundCompositions can now be heard in 'private space' as '3D Space-sound-(Installation)Experience'. The Wergo-Website gives information on the CD/DVD publication as well as the bundle can be ordered there online, too.